When you have a mechanical fox for a buddy, how can the adventure be over? Daring! Danger! Buried treasure! Hidden secrets! Brand new thrills from the Cogheart world to get you all wound up. 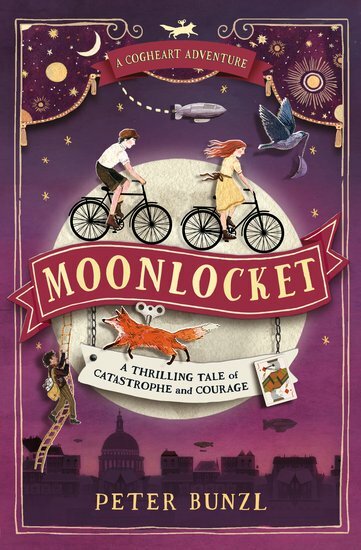 When Robert and Lily return to the burned-out wreck of Robert’s house, they find a strange trinket hidden in the ashes: the mysterious Moonlocket. Soon they’re swept into a dangerous quest to find Robert’s mother in London’s glittering Theatreland. But a criminal mastermind, the sinister Jack of Diamonds, wants the locket too. Can Lily, Robert and mechanical fox Malkin stay one step ahead of him, before he plays his final deadly card? 790L Lexiles are the global standard in reading assessment. They are unique as they are able to measure a child and a book on the same scale – ensuring the right book gets to the right child at the right time. For more details see What is a lexile?.